Guests at Boston Bed and Breakfast are immersed in classic Boston traditions like cobblestone sidewalks, gorgeous brownstone buildings and fabulous places to sip a warming hot coffee or hot chocolate. During the winter months, are historic city is transformed into a winter wonderland with fabulous activities abound. From our downtown Boston location anything is possible. Another favorite of our favorite things to do in New England is ice-skating. Whether you are taking the family to the Frog Pond or your sweetheart across the river to Cambridge, everyone can enjoy himself indoors and out. Probably one of the most iconic skating locals is the Frog Pond in the Boston Commons. 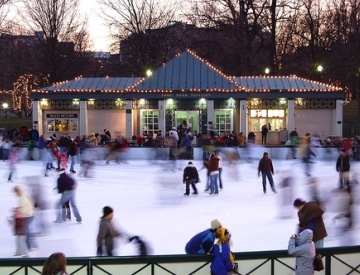 The Frog Pond offers public skating, private lessons and ice show spectaculars on special nights such as First Night on December 31. Admission is $5 per adult and free for children under the age of 13. Skate rentals and sharpening are also available for $9 and $8 respectively. Another magical outdoor skating rink is Community Ice Skating Rink in Kendall Square Cambridge just off of 3rd Street. This Rink is exceptional. The landscape surrounding the rink provides a fabulous setting for enjoying winter in the city. The Community Rink in Kendall also offers affordable admission and rental rates, $5 for Adults, plus $8 for skate rental. Love ice skating in Boston? Consider the season pass for $80. This rink has all the services like lockers, concessions and lessons you need. For those of you who are not as fond of winter weather, there are plenty of indoor options as well. The Steriti Memorial Rink in the North End offers free public skating during the winter until March. While admission is complementary, skate rentals are $5. This is one of the best options for indoor ice skating in Boston. The rink has huge windows overlooking the Warf and creates the illusion of skating outdoors, while still staying cozy warm inside. And of course, the fabulous restaurants and cafes of the North End are all at your fingertips! 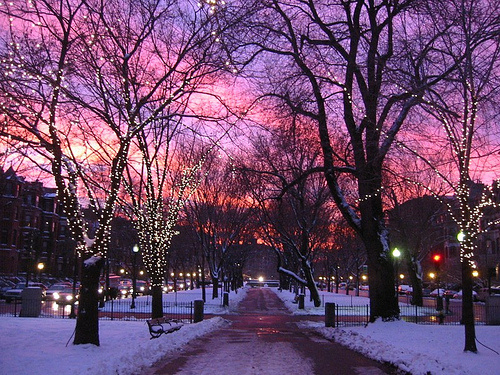 These and many other ice skating locations are great opportunities to experience Boston winter at its best. Clarendon Square Bed and Breakfast is conveniently located close to public transportation for easy travels across the river & across town.If you find the winter weather a little too cold, you will find our warm home and atmosphere to help take the winter chill off — and if not, try a soak in the roof top hot tub! This entry was posted in Uncategorized and tagged boston bed and breakfast, boston common, downtown boston, frog pond, ice skating boston, indoor ice skating, things to do in Boston by admin. Bookmark the permalink.